Nadia David began her studies at young age at the George Enescu College of Music in Bucharest. After immigrating to Israel in 1972, Ms. David was accepted to the prestigious Rubin Academy in Tel Aviv where she continued her studies with Professor Uzi Wiesel and Rami Shevelov. In 1973 Nadia David moved to the Netherlands where she was admitted to Professor Jean Decroos’ soloist class at the Amsterdam (Sweelinck) Conservatory. She graduated with the Highest Honours in 1978. Ms. David spent an additional year studying with André Navarra in Detmold, Germany and with Romanian cellist Radu Aldulescu. Ms. David was awarded the "Prix d'Exellence", the highest award granted to artists by the Dutch Government in 1982. Her solo debut at the Royal Concertgebouw the following year was met with universal acclaim. Nadia David enjoys a solo and chamber music career that has taken her to major halls in Europe, Israel, South America and the United States. She performed at important venues in the Netherlands (yearly appearances at the Amsterdam Concertgebouw), London, UK; Paris and Prades, France; Rome, Italy; Kohln and Trier, Germany; Salzburg, Austria; Athens, Greece; Torroella de Montgri, Spain; as well as the Corcoran Gallery, Washington DC; Carnegie Hall, New York; Louisville Festival, Kentucky; and Bogota, Colombia. Together with violinist Joan Berkhemer and pianist Klara Wurtz she formed the Klavier Trio Amsterdam in in 1990. By fusing their musical talents they have created a highly accomplished trio, which has received critical acclaim and recognition for performances at many international venues. The Klavier Trio Amsterdam recording of the two Mendelsshon Piano trio’s was hailed as the” best of the year” in the International Record Review. Her duo’s with famous Dutch pianist Cor de Groot and Fanja Shappiro were broadcast by Dutch National Radio. Nadia David made recordings for various Dutch Radio and Television Broadcast Companies, as well as for the YMCA, Israeli Radio and for Broadcast Companies in the United States. She was a member of different chamber music groups: the Amsterdam String Trio, together with Joan Berkhemer and Esther Apituley, and the Flute Quintet, with Abbie de Quant (flute), Massumi Nagasawa (harp). Along with traditional recital formats, Ms. David has explored multi-media performance and collaborated with several contemporary dancers to create improvised and set programs at leading venues in The Netherlands. 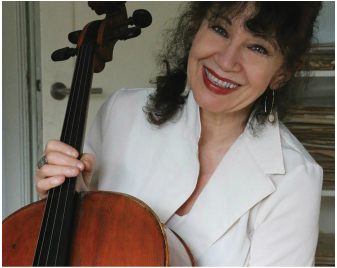 Deeply interested in imparting knowledge to musicians, Nadia David has built a cello studio with students from all over the world. As a pedagogue who draws upon a wide variety of sources, Ms. David has completed extensive research into the Feldenkrais method ( Awarness Through Movement) and incorporates its unique mind/body training into her teaching. Presently Nadia David is working on a recording project of the complete works of Schubert’s Piano Trio’s and of the Bach cello solo suites.